Okay, so I have some major things to tell you. First of all, these Queso Stuffed Poblanos are everything. HONESTLY. Those mild, delicious green poblanos are cut in half and filled with a fluffy white rice mixture that has been simmered in a quick homemade tomato-onion-cilantro type sauce and stirred into happy goodness with sautéed mushrooms and spinach, and of course, a very large handful of melty cheese. They are then popped into the oven to become something reeeeeally savory and delicious. And by savory and delicious, I mean awesomely cheesy. Ugh. Like, these are definitely the best stuffed peppers I’ve made in recent memory and eek! I just made some not that long ago. Am I a horrible food blogger for telling you I like these better than the recent crockpot stuffed peppers? I think that wins a new kind of self-sabotaging blogger award. I definitely loved the other ones, too – I would not lie to you! – and what’s not to like about something that’s ready as fast as those little crockpot guys are? Those win in the convenience category. But I think these new stuffed peppers have helped me come to realize that I prefer poblano peppers over bell peppers, and (SURPRISE) white rice over quinoa. There is a time and a place for everything – and this recipe is ze time and ze place for ze white rice and ze cheese. Secondly on my list of things to tell you today, (remember, I was making a list? 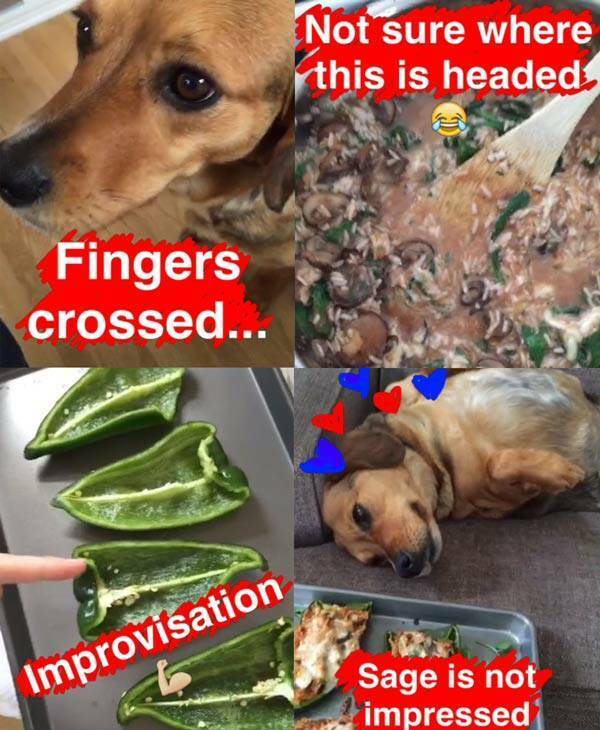 DISTRACTED) you should know that these queso stuffed poblano peppers were sort of a mistake gone right, as you might remember from Sage’s and my really scrappy SnapChat video where we admitted halfway through the recipe that we had no idea what we were doing and that this recipe might not turn out. Thankfully, we adapted, we improvised, and in the end we came out with a Queso Stuffed Poblanos victory. PS. SnapChat? You and me? Friends? I’m @pinchofyum and I post 60% dorky food videos and 40% dorky Sage videos. Thirdly, let’s talk about yesterday which was Cinco de Mayo. You probably did something super fun and fabulous because you’re fun and fabulous like that. DANG. This would have been a great recipe post for Cinco de Mayo, and yet here I am, posting it the day AFTER Cinco de Mayo. Am I slow on holidays? Maybe yes. Okay fine, ALWAYS yes. I did make that 5 Minute Magic Green Sauce (I’m so sorry for how much I talk about that stuff but also: not even that sorry) and I did watch two more episodes of our latest TV binge show, Revenge (!!!! ), and I did take my new birthday rollerblades out for their maiden voyage with Bjork and my sweet baby Sage during which time none of us lost any limbs or teeth, all of which was fun and wonderful, but not really Cinco-de-Mayo-y. In looking back, I super wish my day and your day would have involved these Queso Stuffed Poblanos. Us, together, eating cheesy stuffed peppers with rice and mushrooms and spinach, rocking the vegetarian vibes. Can we make that right starting, um, now? Fourthly and finally, as you might have seen in my Snap vid, for these peppers I used some kind of mystery magic called Queso Melt. I have no idea if this is a brand or a type of cheese or what – I just found a block of in the fancy cheese section at Target, so I shredded it up, stuffed it into my poblanos, and reaped the gloriously melty cheese rewards. There’s a good chance that sometime in the future I’m going to find out that this cheese is actually just Velveeta repackaged with the name Queso Melt, but until that happens, I’m giving it my wholehearted cheese-loving recommendation. It’s mild and creamy and it melts like a dream. With all that white rice and tangy tomato sauce and the sautéed mushrooms and spinach? Ohmyword. Heaven sent. GET IT. Get all of it. Goooo. These Queso Stuffed Poblanos are filled with sauteed mushrooms, spinach, rice, and a homemade sauce and topped with melty cheese. For the sauce: Preheat the oven to 400 degrees. In a food processor or blender, puree the sauce ingredients until mostly smooth. Set aside. For the filling: Melt the butter in a large skillet over medium high heat. Add the reserved red onions and mushrooms; saute until browned and softened. Add the spinach; saute until just wilted. Add the rice and stir around in the pan to coat. Add 2 cups of the sauce from step one, stir, and simmer over medium low heat. Continue to simmer, adding a little water if necessary, until the rice is cooked (about 20 minutes). Stir in one cup of the cheese. 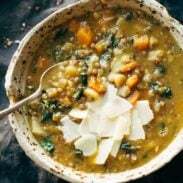 If the mixture seems too runny, add a few tablespoons of the flax meal to act as a binder that will soak up excess moisture and hold everything together nicely. Taste and season with salt if needed. For the peppers: Cut the poblanos in half lengthwise and remove the ribs and seeds. Top each half with a few spoonfuls of filling and a pinch of the remaining shredded cheese. Bake for 15-20 minutes, until the poblanos are softened and the cheese is melted. With this amount of filling, I filled about 8-10 poblano halves. These look so good! Ideas for the leftover sauce? Would 2 cups of jarred salsa work here, too? Jarred salsa, just asked for extra at Chipotle they give one extra cup for free and I find I always need it in my burrito bowl! Better still, I need to make these stuffed peppers. My husband says I “bomb” stuffed peppers. But c’mob, the cheesy top. This is so done. Cute Sage pics. Hey Laura! I use it mostly to make rice and other fillings for Mexican dishes. It’s like a really basic simmer sauce. I used a similar sauce for the lentil and rice quesadillas, and while it is similar to salsa, I find that using jarred salsa just isn’t as good. Same idea though – and I think in a pinch either enchilada sauce or salsa would work. It’s never too early to make cheesy stuffed peppers! Ugh, like where did that show come from and why is it so addicting?! haha! This looks so good! I love stuffed poblanos. I’m excited to try your version of it! Awesome! I hope you like it Sydney! These look amazing! That last picture just makes me want to dive in to the computer screen! Now if I could only figure out where to find poblano peppers and queso melt in the UK… off to research substitutes! Yes to these Stuffed Pablanos at 9am!!! Especially with that homemade tomato-onion-cilantro type sauce with melty cheese! Oh gawsh! I KNOW RIGHT!! Good morning? Aaaaand, just when I thought I had my mexican Mother’s Day menu planned! I think I’m going to have to add these–they look A-MAZING. Oooh hooray! Thanks Manon – hope you like them! these look soooo good esp with the rice. Sometimes the only thing that will do is good old white rice. I lol’d at your white rice vs quinoa admission. I have always made brown rice or quinoa in the past, but I have recently made white rice with my stir fry and now I can’t get enough of the dang stuff! I KNOW! It’s so weird, I actually do really like brown rice and quinoa, but now that I’ve gone back to white a few times… eek. This could be the start of a major backslide. Looks amazing. Is this spicy? I haven’t used this pepper much. No, poblanos are considered pretty mild. Just be careful to remove the seeds and ribs from both the poblanos and the jalapeño in the sauce. I can’t get enough of the pictures of Sage, too cute! I think I need to make these for a belated Cinco de Mayo dinner, they look delicious. We are sort of obsessed with her. Okay, me specifically. I am obsessed. A) I need these peppers in my life ASAP. B) That green sauce though, seriously the best. I now tell all my friends about it, probably too much. C) REVENGE IS KILLING ME! Can’t believe there is only one episode laugh. Tear. Oh my gosh, we are just starting Revenge so I am no where near to the end… but even just knowing the end is coming… sad face. I kinda slept on Cinco de Mayo and not sure if it’s because I’m doing this 21-day vegan challenge but my tastebuds are definitely craving something comfort foodie like this! This is going on our dinner tables tonight! Thank you Lyndsay! Awesome! I hope you like it Dorcas! Queso is just the best! Your improvisation looks delish 🙂 pinning! Thank you Medha! Appreciate that! Sage says Your Welcome. Or hi. Or whatever laying on the bed with puppy dog eyes means. Glad you found that queso melt! No more messing with low-moisture shredded cheese. Ingredients — cultured milk, skim milk, cream, salt, sodium phosphate, enzymes. LOLS! So true Abby. So true. 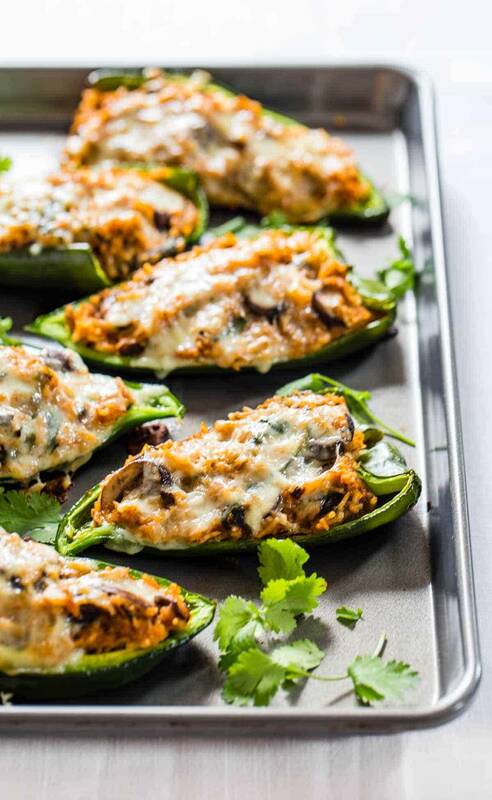 Love the idea of doing stuffed poblanos! I need to put this on my list to try. Awesome! I hope you like them Julia! I love *stuffed* recipes… specially for children. Any vegetables that aren’t going well with the little ones gets upgraded so well when they are stuffed. Haha, I was wondering about the super Mexican recipe right after Cinco de Mayo! I’m so the same – holiday recipes always come to me just after. Who cares, Mexican food is always awesome!! Love the look of these stuffed poblanos – and keep the Sage pics/snapchats coooomin’! Yeah – it was definitely not planned… but kinda works, right? Seis de Mayo? Thanks for the Sage/Snap love! I’m excited to try these! I could eat mexican food every day of the week and my mouth is already watering! I’m curious if you have a suggestion for a mushroom replacement- I’m not such a fan of the fungi! Also, are these enough for a main course? Or suggestions for what to serve alongside? Thanks!! For me it’s enough for a main course! 🙂 I eat two halves (okay fine, maybe two and a half) so it’s a pretty hefty meal. And for the mushrooms… is there another veggie you’d like? Or to make it feel more like a main, you could add some ground meat? tofu, even? Thanks Lindsay! So excited to try! Hahaha your dog is too cute! Shouldn’t have read this post before breakfast… it looks too good! Thanks Hannah! WE LOVE HER and that’s a major understatement. Love this and your snapchat!! Thank you Jillian! 🙂 So appreciate that! These look wonderful! Do you think they would freeze well? Thank you! I always get a little wary of freezing veg dishes, like the peppers might get mushy, but the cooked filling would freeze great!